The best part about Christmas is the food. There’s just no denying it. It’s the one time of the year where we can eat whatever we like without society’s pressure to eat less and lose more. As soon as I see those Christmas food guides in the shops, I pick them up and look through them while eating a mince pie. While planning our Christmas feast, I decided to go through these guides and pick out my favourite items from each supermarket. This year, I’m sharing with you Tesco, Morrisons, Sainsbury’s, M&S and Aldi. 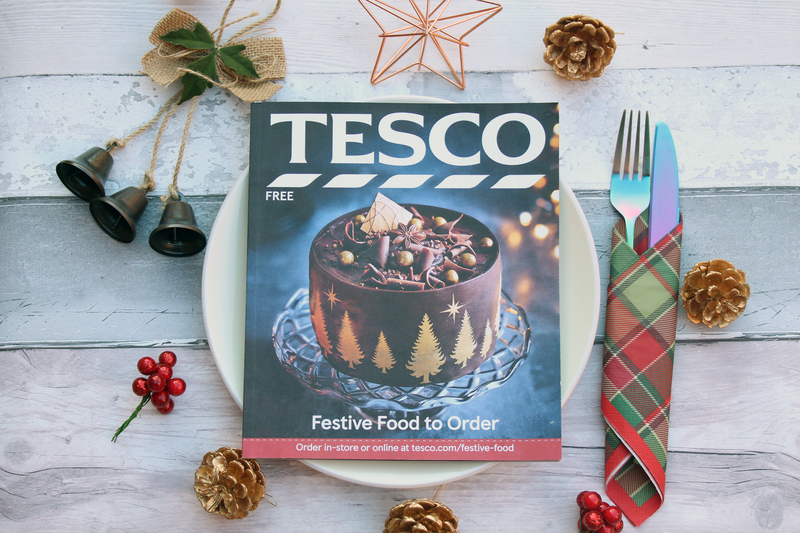 The Tesco Festive Food to Order book opens with desserts. There’s no better place to begin in my opinion. There were two which stood out to me and they were the Finest Spiced Magical Woodland Cheesecake which promises a salted caramel centre, cinnamon base and Charlotte Russe sponge. This can be yours for just £10 and it serves 6 people. The other dessert we loved the sound of was the Finest Sticky Toffee Wreath. Soft toffee sponge, date pieces and a rich maple glaze make up this impressive dessert which again, is £10 and serves 6. We’ve gone with the cheesecake, just because it looks so cute and kitsch. Next is the vegetarian food alternatives. Tesco are offering four options but only two stood out to me. The first is the Finest Stuffed Half Butternut Squash. Filled with a mixture of beetroot and apple and scattered with seeds, this would look impressive being brought out to the table. This is £9 and serves 2-4, whether it’s as a main, side or starter. The second was the Finest Cauliflower Wellington which is actually vegan. A whole marinated cauliflower is surrounded by a duxelles of mushroom and butternut squash and surrounded by puff pastry. It’s £6 and will serve 2 people as an alternative to turkey. Speaking of turkey, Gareth chose two from the food guide. The Finest British Free Range Easy Carve Bronze Turkey with a Pork and Roasted Chestnut Stuffing which can be roasted in the bag and is finished with a bacon lattice and a black pepper butter star. This is £30 and will serve 9, hopefully leaving plenty for leftovers. The other turkey he chose was the Finest British Free Range Bronze Turkey Breast with Pork, Bramley Apple, Honey and Sage Stuffing which will cost you £20 and will serve 6 of you. He also chose some meat alternatives which was a Beef Rib with Mustard which costs between £26.40 – £36 for 6 people and a Crackling Gammon Joint with Maple and Bourbon Glaze which is £16 for 13 people. There wasn’t really much in the food guide in terms of sides. There’s a Prepared Vegetable Selection which is £12 and contains everything you need veg wise, included red cabbage and cauliflower cheese. There’s also a Ready to Cook Fresh Vegetable Selection. This is £8 and takes a lot of stress out of the Christmas dinner. And who can forget the Pigs in Blankets? You can get 12 for £10 from Tesco. The party food is similar to the sides. I think if you wanted to get party food from Tesco, you’re better off going in store to their frozen section. However, the guide did have some delicious sounding vegetarian foods such as Mini Vegetarian Sliders (24 for £12), Breaded Cheese Selection (32 for £8) and a Vegetarian Gala Pie for £14. Most of our cupboard and chilled food is coming from Tesco so for instance, Gareth has chosen the maple gammon and some turkey parcels for him and the boys and the woodland cheesecake is going to be our dessert. I started our cupboard shopping yesterday and I picked up 90% of it from there. Visit the Festive Food website and find the products you want. Book a slot for home delivery or Click and Collect and place your order between 26th November for Delivery Saver customers, 30th for everyone else. Add your food order to your food basket, you can even add it alongside a regular food order. Just make sure you checkout before the 11.45pm on the 14th December. So there we have it, my guide to the Tesco Festive Food available for 2018. Make sure you check back tomorrow when I’ll be showing you all that Morrisons has to offer this year!